I'd like to invite you to my lecture that launches a series of events for the Craft Council of BC's 40th anniversary celebration. 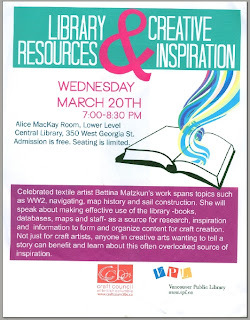 I'll be talking about how I use library resources for the research that goes into my work, dwelling on history, geography, sail making, and weather, rather than "how-to" books on art (although the library has those, too). As an artist who has a "day job" at a library, I feel I have a wonderful perspective on the great, accessible, affordable treasure chest a library represents. It will be a brief tour of my creative process. A reminder that the 2nd meeting for SDA Alberta is March 20th, hosted generously in her own home by Susan Kristoferson. Details and directions to follow!